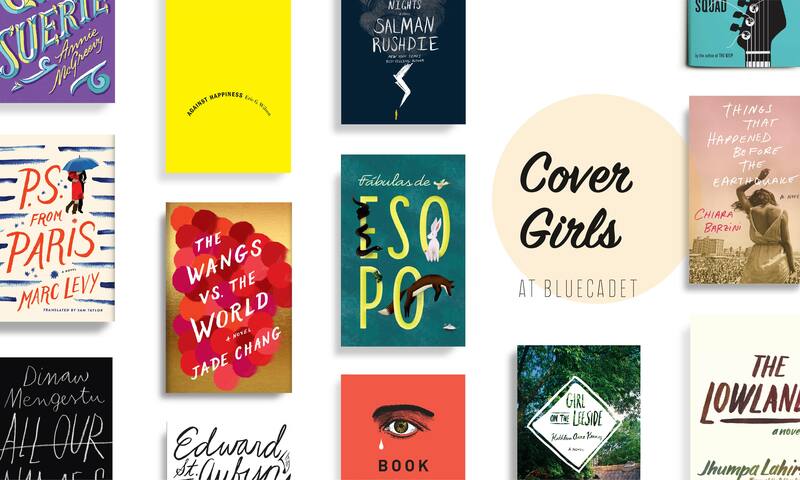 In honor of Women’s History month in March, we are celebrating six inspiring women book cover designers with a special exhibition hosted at Bluecadet in Fishtown. Join us for the First Friday opening reception on March 3, 2017. A Philadelphia native, Emily Mahon studied Graphic Design and Spanish at Penn State before making her way to New York. She became an Art Director at Doubleday in 2006. Emily’s work has been honored with awards from AIGA, The Type Director’s Club, The Art Director’s Club and The New York Book Show. She has been published in 50 Books/50 Covers, TDC Annuals, Communication Arts, Graphis and Print, among others. When hate happens, we are faced with two choices: Ignore it, do nothing and let the hate go unchallenged. Or, take action and do something—rise up, speak up and unite against hate. Unfortunately bias is a human condition, and American history is prevalent with prejudice against groups and individuals because of their race, religion, disability, sexual orientation, political beliefs or other differences. Hate is an open attack on inclusion and decency and it must be countered with acts of kindness. The good news is, all over the country people are fighting hate, standing up to promote inclusion. As a community, let us join together in an act of solidarity. Let us unite and rise as one voice. Let us use our creativity to exhibit a positive force against the intolerance that is occurring within our society today. Just imagine, what we, as an entire community, working together, might do if we design to unite with an exhibition of love, inclusion, acceptance and unity. 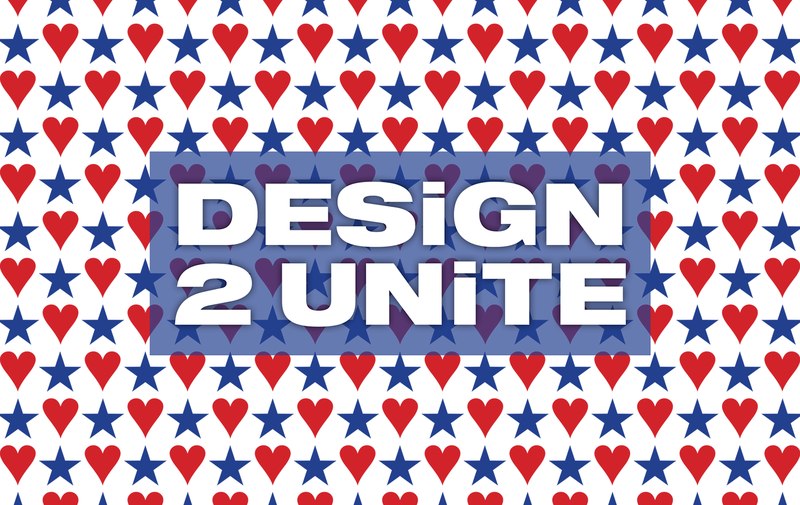 #Design2Unite is an open call for designs that express these sentiments in a non-partisan way. 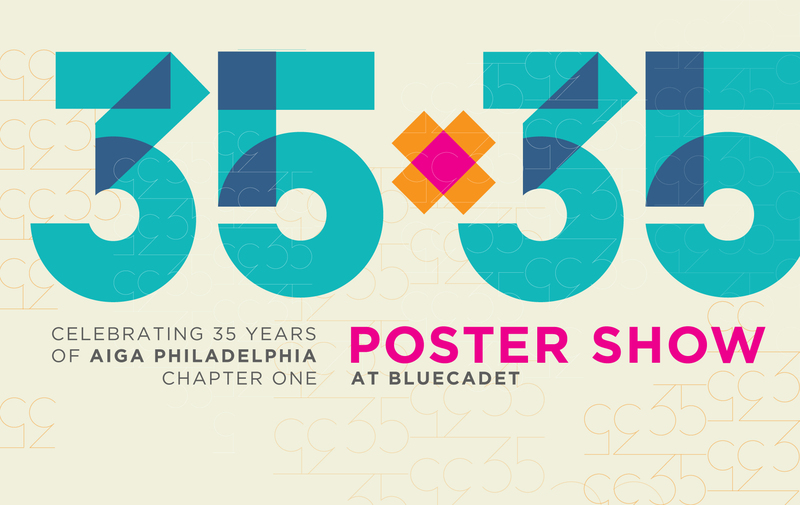 This year marks 35 years since the founding of AIGA Philadelphia. In 1981, a group of Philadelphia designers formed AIGA Philadelphia—the first local chapter of the American Institute of Graphic Arts. The chapter has grown from 25 original members into a thriving community of over 700 members today. To mark this milestone occasion, we invited 35 influential Philadelphia-area designers and those that have played a significant role in the history of our chapter to design posters for a commemorative collection and exhibition. The theme of the posters is the role of design in Philadelphia and the important influence AIGA has had, and continues to have, on our local design community. 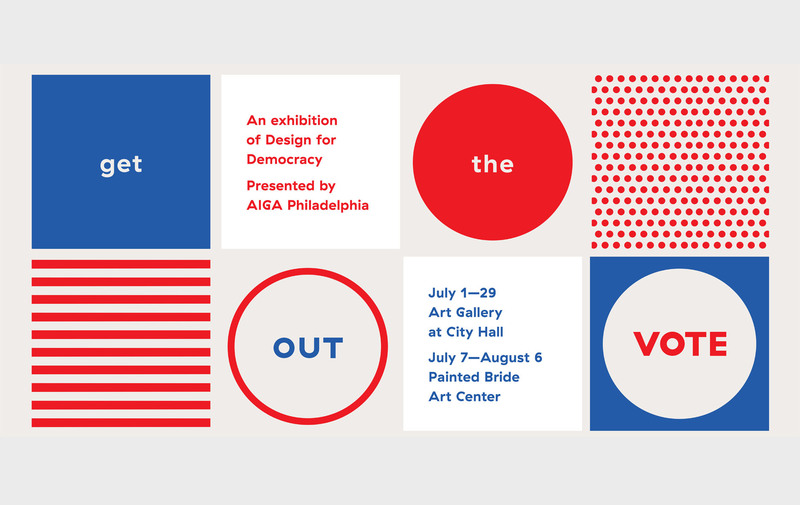 AIGA Philadelphia is honored to host GET OUT THE VOTE during the Democratic National Convention and throughout the month of July, in the very center of our city at the Gallery at City Hall, and at the Painted Bride in historic Old City! This civic engagement initiative wields the power of design to motivate the American public to register and turn out to vote in the 2016 general election. This Special Exhibition will feature original, nonpartisan posters by designers from across the country coming together for the sake of the design of democracy. The posters will also be available for download and display free to the public at www.AIGA.org/vote. This program is presented in partnership with the League of Women Voters’ Vote 411 initiative. The two historic organizations are working together to encourage and inform American voters. AIGA Philadelphia is pleased to present Sorry We’re Closed – an awareness project by designer and educator, Kelly Holohan that follows in the footsteps of LGBT design activists such as the art collective, Gran Fury, whose bold designs in the 80s and early 90s communicated the urgency of the AIDS epidemic at a time when there was no government or political action. This body of work is designed to bring attention to LGBTQ human rights around the world. Some of the works focus on issues and legislation surrounding employment, marriage, privacy and acceptance. Others illuminate the terrifying life and death obstacles that many people face every single day. AIGA Philadelphia is pleased to showcase the work of our region’s exceptionally talented design educators. This biannual exhibition will feature posters, letterpress, digital, and some unexpected conceptual work. Come see what Philly’s faculty do when they are not teaching. Design is fueled by observation and reflection of our surroundings. What happens when functional changes beyond our control force us out of our creative comfort zone? You’ve heard it said; “change is the one constant”. That’s the rule in today’s design economy. How do you adapt? To be prepared, be good at multiple design-related disciplines. Having a diverse skill set will keep you fresh, busy and ready to make the next change. AIGA Philly is proud to announce Ray Nichols & Jill Cypher of Lead Graffiti will be exhibiting their exciting project Tour De Graffiti at SPACE Gallery for the month of June. Tour de Graffiti is a major endurance letterpress project which returns for its fifth tour at Lead Graffiti Studio in July. Following the Tour de France Lead Graffiti produces a series of 23 letter press posters. One poster each day is produced with guest contributors who collaborate with Ray and Jill to create a letterpress poster paralleling the events of each stage of the Tour de France. The exhibition will include highlights from this previous years projects. More about this exciting project can be found on Lead Graffiti’s website here. AIGA Philadelphia is pleased to present a showcasing of local comic book artists, visual communicators and storytellers. The show features local talents of diverse aesthetics whose work shares the connection to the comic book (sequential art and design) medium; be it through visual communication and storytelling, and designs that feature the characters and stories that have influenced the pop culture landscape. Curated by Chase Alexander and Gaby Heit. In his debut AIGA Philadelphia exhibit, designer and educator Alex Yampolsky explores visual navigation concepts to enhance urban commuter experience. As an urban commuter himself for over twenty years, Alex understands the challenges experienced by daily commuters and visitors in getting to and from their destinations. In his independent design study he seeks to achieve efficiency and visual clarity in presenting complex amounts of information via content organization, iconography design and user interface development. This is a Call for Art, and we invite the public to participate! Help AIGA Philadelphia support the community at an exhibit of community-based work. YOU are the Designer, YOU are the PageMaker! AIGA Philadelphia SPACE will cover it’s walls with a rotating array of your 8.5” x 11” donated drawings, designs, prints, collages, you name it. A First Friday public reception celebrating all the PageMakers will take place on March 6, 6-9pm. All Pages will be sold for $10 to support on-going programming at AIGA Philadelphia. Copies of selected Pages will be printed for a very limited edition book. AIGA presents Mixed Meow this month at SPACE Gallery. Mixed Meow is a show that looks at cats as a symbol of the zeitgeist of our meme culture with work that encompasses low and high, digital and analogue. From Owen Mundy’s online work, “I Know Where your Cat lives”, to an anonymous French flea market painting, this collection of works looks at the image of the cat in contemporary moment. With an eye to the everyday, the political and the humorous this exhibition highlights the image of the cat in contemporary visual culture and aims to understand the elusive feline. Once again AIGA Philadelphia will be transforming AIGA Philly SPACE into a Holiday Pop-Up Shop for December into early January! Our awesome members will be selling their one-of-a-kind art, craft and design items in our Old City gallery, opening on First Friday, December 5, 6–9pm. Philadelphia was pleased to announce the selection of Mark Willie as the 2014 recipient of the distinguished AIGA Fellow Award. Mark’s work was on display at AIGA Space and celebrated with a reception in November. Read more. The Hamilton Wood Type and Printing Museum is the only museum dedicated to the preservation, study, production and printing of wood type. With 1.5 million pieces of wood type and more than 1,000 styles and sizes of patterns, Hamilton’s collection is one of the premier wood type collections in the world. In addition to wood type, the Museum is home to an amazing array of advertising cuts from the 1930s through the 1970s, and all of the equipment necessary to make wood type and print with it, as well as equipment used in the production of hot metal type, tools of the craft and rare type specimen catalogs. We believe there’s something special about all the communities that make up our city. No matter the size or location, we all feel a sense of pride and love for our neighborhood. Under the guidance of AIGA student mentors from around the region, kids ages 8-12 created a poem and supporting collage expressing their love for their home. Come appreciate the work of these young visionaries and tell us what makes your Philly unique. In its fourth year, This is My Philly, a partnership with AIGA Philadelphia and Spells Writing Lab, helps kids celebrate their unique neighborhoods through words and pictures. Photographed and written nearly 50 years ago, this book recounts Joel Katz’s experiences in Mississippi during seven weeks of “Freedom Summer.” Published by the University of Alabama Press. Joel Katz—designer, photographer, and teacher—is widely known for his information and graphic design and for his wayfinding projects. Cursed with a hopeless sense of direction, his maps and signs reflect a combination of innate survival instinct, professionalism, and passion. Walk!Philadelphia and Ride!Philadelphia are among his most notable wayfinding works. #phillytype is a community-sourced project documenting the vernacular typography and signage of Philadelphia’s cityscape. Started in July 2012 as a way to bring together local type buffs and documentarians over a shared appreciation for the craft of typography, #phillytype offers testifies to Philadelphia’s changing urban landscape, anticipating its future while preserving its history. Curator Danielle Palencar draws from the #phillytype hashtag on Instagram, seeking the best representations of found type shot by hundreds of the city’s street photographers, signpainters, graf writers, designers, architects, social critics, and Philadelphia evangelists. Prior to the lecture, the unexpected design work of Go Welsh, a Lancaster, PA-based studio, visits AIGA Philadelphia’s SPACE gallery. A range of attention-grabbing and internationally-exhibited projects using materials as varied as license plates, paper towels, anodized aluminum, cardboard boxes, and more, will be on display throughout May. The First Friday opening reception will 5/2 starting at 5pm. All exhibits at SPACE are free to the public. Geeks en masse will see the displayed work since our exhibition will coincide with Philly Tech Week and continue through April. Alongside projections of the work, lenticular prints by Silicon Fine Art Prints, we will be covering SPACE with QR codes (gasp!) for a new kind of gallery experience! AIGA Philly is proud to announce that the work of internationally renowned graphic artist, Kate Moross will be displayed free to the public from Saturday, March 1 to Monday, March 31 at SPACE (72 North 2nd Street). There will be a First Friday grand opening on Friday, March 7. All prints will be available to purchase thanks to support from the The Phoenix Group. We at AIGA Philadelphia have put together a special exhibition of the Philadelphia area’s finest in-house creative! The best of Annual reports, invitations, brochures, websites, packaging, collateral, communications, etc. created by in-house creative teams are on display at SPACE right now! Friends don’t let friends gift ugly holiday sweaters. ‘Tis the season for local design talent to shine: AIGA Philadelphia has been cleverly transformed SPACE into a Pop-Up Shop for December! We invite you to find that perfect gift amongst our collection one-of-a-kind art and design items. The Center for Emerging Visual Artists and AIGA Philadelphia presents In the Woods: a solo exhibition by Nick Cassway which presents a series of illustrations in the context of road signage. The shapes, stature and materials literally become “warning signs” which are scattered throughout a darkened gallery and discovered only with the aid of a flashlight or headlamp. Over the course of summer 2013, AIGA Philadelphia partnered with Clean Currents (a B-Corp certified wind power company), Kensington Renewal, andDelaware Valley Green Building Council to tackle one of Philadelphia’s greatest challenges. Pairing creative professionals with high-school-aged students, the Lots of Power mentoring program worked to develop innovative ways to rehabilitate and revitalize vacant lots in Kensington. Two teams have been awarded grants to implement their projects—come see all the work, meet the teams and enjoy the show! Sponsored by Clean Currents and AIGA Philadelphia, with live music by the School of Rock. The work will be exhibited at SPACE through October. Have you ever heard the expression, “Those who can, do; Those who can’t, teach”? AIGA Philadelphia has set out to disprove that theory. These amazingly talented professors from the Philadelphia area have dedicated their lives to training the future generation of creatives while their own work remains at the top of their fields. This exhibition will be a survey of some beautiful—and often award-winning—work produced by those who can teach. Sulki & Min are a Seoul-based design duo who met while studying at Yale in 2001. In the intervening 11 years they’ve worked together constantly, refining their graphic work and intensifying their studies, including doing research at the Jan van Eyck Akademie in Maastricht. Their work balances experimental and commercial work, including designing the logo for the prestigious BMW Guggenheim Lab in 2011 and an issue of PRINT Magazine in 2012. The Kensington Riots. The birth of graffiti. Trials for sedition. Information architecture. The Monotype Factory, run by women. “Great Ideas of Western Man.” The Underground Railroad and Design Laboratories. AIGA Philadelphia explores the soul of a place, through the historical context of graphic design in Philadelphia, in an exhibition showcasing Philadelphia works both contemporary and historical. The city has been at the center of numerous movements and breakthroughs in design, all of which have contributed to a unique interplay between the fabric of the environment and design’s cultural force. Come experience these currents and their convergent paths as we aspire to better understand the direction that the craft is headed in the future. Get your wardrobe ready for SPRING! Opening for First Friday in April, AIGA Philly is hosting a T-Shirt Design show and sale entitled “Off the Rack.” All shirts, designed by members of AIGA Philadelphia, will be sold at $20.00 and 30% of the proceeds will go to benefit operations at AIGA SPACE. Join us in celebrating the new season with beer, wine and some real designer fashion! MAPnificent! Artists Use Maps brings together a group of artists who creatively employ the philosophy and technique of mapping to convey information ranging from sociological data to aesthetic stimuli. Artists include Paula Scher, Joyce Kozloff, Doug Beube, Carole P. Kunstadt, Viviane Rombaldi Seppey, Karin Schaefer, Dahlia Elsayed, Alastair Noble, Aga Ousseinov, Paul Fabozzi, Amy Pryor, Irina Danilova, Robert Walden, Ariane Littman, Jeff Woodbury, Brooklyn Art Library, Hand Map Drawn Association. “Locals Only,” a group show consisting of neon signs inspired by local bars, warm beers and the cold neon glow of hometown dives. The group show will feature pieces from Philadelphia-based designers, illustrators and artists working in the medium of neon. Artists include Greg Christman, Julle Frey, Sharon McMullen, Kevin Jackson, Kenny Kim, Steve DeCusatis, Dan Gneiding, Patrick Macomber and Joel Evey. The AIGA Philadelphia Speakeasy’s Silent Auction continues!! Artwork, gift certificates, memberships and merchandise are up for bidding on ebay! AND for a limited time up at SPACE. These artists from The Chemical Heritage Foundation’s original exhibition Elemental Matters: Artists Imagine Chemistry invent different ways to experience the elements. Read the periodic table in Braille (David Clark), or as illustrated in 118 unique prints by 97 different artists (Jennifer Schmitt). Tricia Treacy and Ashley John Pigford created a Computer Numerically Controlled (CNC) router to then create wood type of the digital font Vista Sans™. A set of five of these letters, spelling “touch,” was sent to 20 international designers/artists/printmakers/studios, along with a set of paper. Each participant was challenged to interpret these materials as an edition of prints. The exhibition includes all of the prints and video documentation of how the type was made. More information: vswtp.org. Since 2002, Jason Kernevich and Dusty Summers have been creating posters, illustrations, and book covers for clients such as The New York Times, Starbucks, Penguin Books, the School of Visual Arts, the New York Public Library, and bands such as Wilco, R.E.M., and the National. Celebrate 10 years of award-winning image making at AIGA Philly’s SPACE on September 7th, 2012. Masthead brings you a plethora of prints based on the common and uncommon “Vices” we have to deal with as a society. Gain a little insight on what keeps these illustrators and designers at the tip of their toes. Featuring work by: Julianna Lose, Greg Christman, Dan Gneiding, Erik Hamline, Robb Leef, Ralph Stollenwerk, Alex Eckman-Lawn, Kenny Kim, Lucy Price, Hilary Segdwick , Chris Romano, Dave Orantes, Julianna Lose, Sam Heimer, Eyysse Ricci, Steven Speir. Crystal Shepard, James Heimer, John Kane Smith, Ryan Johnson, Kevin Kernan, Shawn Hileman, and many more. John Langdon does just about everything that can be done with words. John is a logo designer and custom typography specialist, a lettering artist, and a writer. He teaches in the Graphic Design program in the College of Media, Arts and Design at Drexel University in Philadelphia. John’s passions for language, illusion and ambiguity are best realized in his ambigrams, which form the basis for his 1992 book, Wordplay, and captured worldwide attention as focal points in Dan Brown’s bestselling novel, Angels & Demons. A second edition of Wordplay was published in 2005 by Broadway Books. In recent years, John has taken his wordworks to canvas. He has had solo shows at Drexel, the University of Maryland, the Noyes Museum of Art, The Shipley School, The New Britain Museum of American Art, and his paintings have appeared in juried shows throughout the Middle Atlantic states. Examples of the many facets of John’s work can be seen at johnlangdon.net. Originally shown at PhilaMoca earlier this year, Curator Gaby Heit brings her group show to AIGA Philadelphia’s SPACE. A play on the phrase “the medium is the message” coined by Marshall McLuhan (Understanding Media: The Extensions of Man, 1964), Message & Medium: the interplay of type and art simplifies the controversial phrase in terms of fine art. Featuring artists: Allan Espiritu, Colette Gaiter, Zofia Hausman, E. Sherman Hayman, Gaby Heit, Boots Levinson, Katie Dillon Low, David Macomber, Kari Marton-Rollins, Jon Montenegro, Paula Searing and Brian O’Neill, Jonathan Weary, Matt Zigler. The celebration continues! See the posters of Art Chantry at the AIGA Philadelphia SPACE. Often associated with the posters and album covers he did for bands from the Pacific Northwest, such as Nirvana, Hole and The Sonics; Chantry advocates a low-tech approach to design that is informed by the history of the field. His work has been exhibited at the Rock and Roll Hall of Fame, Museum of Modern Art, Seattle Art Museum, the Smithsonian and the Louvre.